A quality hunting knife is versatile enough to do almost everything a good knife does and then some more. However, its primary function is to prepare game to be used as food including skinning and boning. Hence, the need for having a sharp tool on you. Linkyo uses the two-stage process of sharpening similar to other sharpeners, only the results are beyond what you could call pleasing. 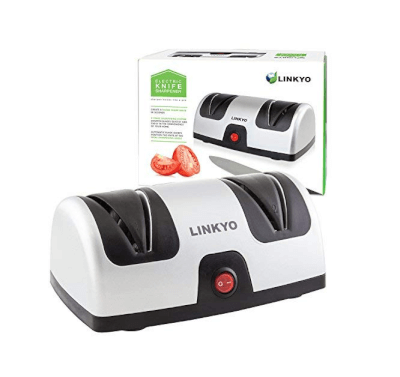 This Linkyo model is one of the best electric knife sharpeners for both your kitchen and hunting knives when needed. 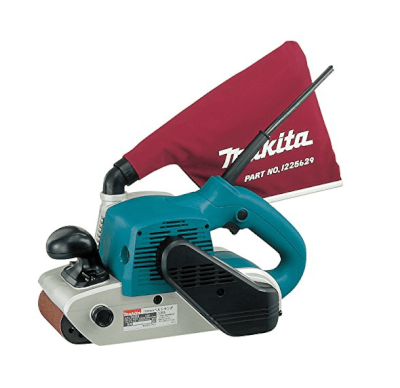 It has an automatic blade position for the right result with each sharpening. With readjusted and polished knives, you’ll be satisfied with the final result from this machine, and the cleanup is hassle-free. It has pre-installed receptacles that catch all the shards and filings from the process to prevent any mess from developing around the sharpener. To top off the purchase, you’re protected with a one-year warranty coverage after buying the sharpener. 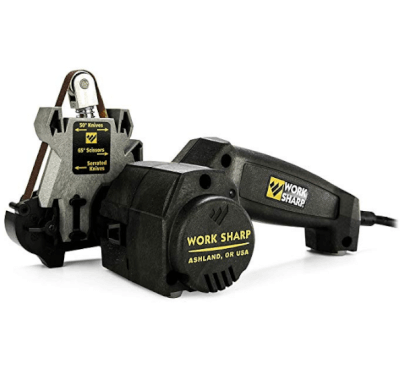 Work Sharp revives all dull blades and knives to their original state of fine cutting edges, making it one of the best electric knife sharpeners, even for hunting knives. This blade sharpener uses abrasive grit belts and comes with extras for specialized sharpening on different knives. There are three different belts for variable sharpening; coarse medium and fine. Sharpening at a 50-degree angle, the results are consistent and fast with each sharpening. Work Sharp Doesn’t only sharpen knives; it can sharpen mower blades, shears, shovels and more. So long as there is a metal edge in need of pruning, Work Sharp will be there to help you. The kitchen may not be your first choice for hunting knives, but this becomes one of the best electric knife sharpeners for all knives with its powerful razors returning all knives back to their striking points. 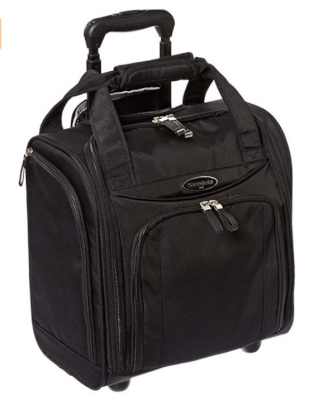 It is a compact package that can easily be stored or packed for travel when in need. It has a coarse and fine option for better tuning of separate knives and their sharpening needs. 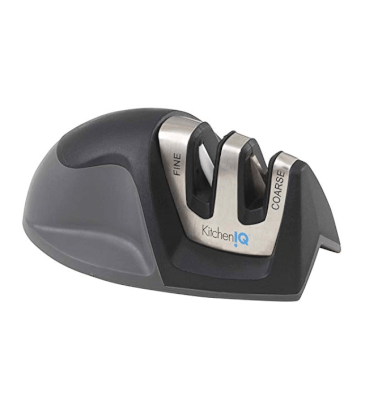 KitchenIQ has a non-slip base so your knife and sharpener don’t slip while using it. 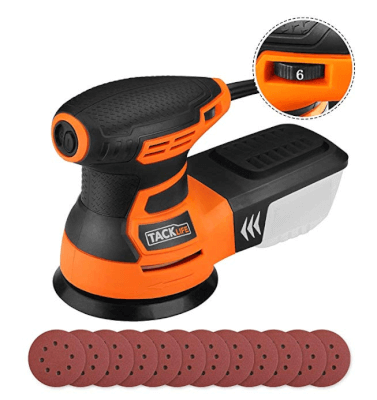 It is extremely easy to use in comparison to other sharpeners. 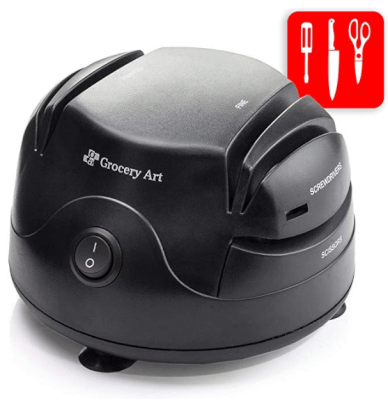 This small sharpener can bring dull and damaged blades back from the depths of their careers in your kitchen. This sharpener can be placed on the edge of your counter, meaning that when the blade drags lower, there won’t be any cuts on the countertop and allows your hand to sit easier while using this sharpener. Secura sharpens non-serrated blades back to their store-bought condition with haste and consistency, perfect for a busy kitchen in need of their quality utensils. This sharpener has two stages to the sharpening process in order to give you the best electric knife sharpener experience for all your knives, including hunting ones. The first one sharpens and revives the slicing edge of your knife. The second stage polishes and tunes the knife for that final quality result you look for in all your knives. 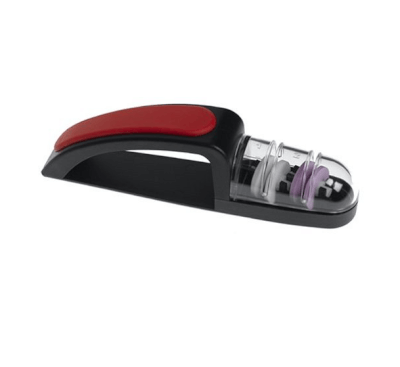 The bottom of the sharpener has 3 suction cups to keep the machine securely in place while it works on your knives. It is extremely easy to use and sensitive to pressure so lightly placing your knife in the hold is enough. Not only is this one of the best electric knife sharpeners for both kitchen and hunting knives, but it also serves as a sharpener for scissors and screwdrivers alike! This three in one addition to your home appliances works great with all your blades, polishing, honing and sharpening them all at the same time. It is light and compact making it an easily storable item in your collection; it won’t even take up much counter space. It does not require for you to press on the blade while using it and stops sharpening when the blade is fit for more work. You can set your sharpener to either coarse or fine depending on the blade’s situation. Small is the right word to describe this sharpener, but small doesn’t mean bad. This is one of the best electric knife sharpeners for kitchen and hunting knives with its compact, consistent performance with each use. This sharpener has a see-through body so you can see the two wheels inside. The pink one is for moderate sharpening while the while one does the heavy duty work on your knives. This sharpener works on all knives minus those that only have one sharpened end. In such a small package, this is definitely one sharpener you can always have on you to keep your knives in their best shape all the time. This model from Chef’sChoice prides itself in the 100% diamond abrasives they use to sharpen your knives back to perfection. Like others, it has two stages to making your knife sheer and sharp for culinary use. This model sharpener uses magnetic guides to direct your knife into the proper position for best sharpening conditions, so pressing on your blade is not a need. To cover any unlikely defects that may occur, this appliance is backed with a one year warranty. The simplistic design is an easy to understand appliance that won’t cause any hassle when using it. All you need to do is plug it in and turn it on. 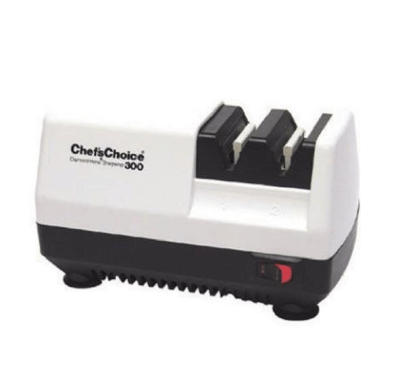 With an easy going usage and effective material for the best results, Chef’sChoice 300 Diamond Hone makes one of the best electric knife sharpeners for kitchen and hunting knives. Chef’sChoice takes a new step to sharpening the edges for your blades with another stage to apply to your knives. The first stage works on the shape and refiguration of your blade while the second enhances the quality edge to it. The third stage strops and polishes your knife for the final masterpiece. It works on a large variety of knives; butcher, sporting, serrated, pocket, and gourmet. This unit is compact and robust, making it easier to store it away when you don’t need it or leave it on your counter without it taking up much space. 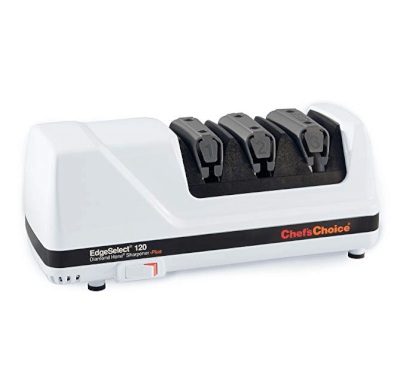 Chef’sChoice isn’t only for the masters, but one of the best options for electric knife sharpeners that can handle butchery to hunting knives. 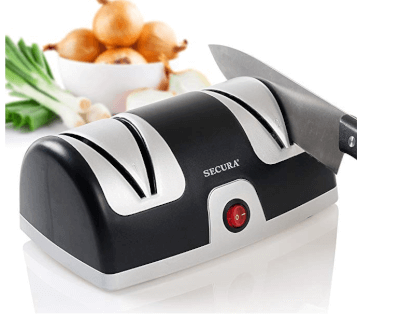 Before you choose an electric knife sharpener, it is first important to consider the type of knives you have in stock. Since not all knife sharpeners can handle every type of blade, this is an important consideration. Sharpeningedges: The best electric knife sharpeners will feature a diamond abrasive surface since this offers the best sharpening potential. Other promising abrasives include tungsten carbide and polished ceramic. Sharpeningstages: Highly efficient electric knife sharpeners will have at least dual sharpening stages. The first to restore sharpening stages the second for knife honing and polishing. Some high end models may even offer three sharpening stages. Sharpeningangle: This refers to the angle at which the knife will sharpen the best. Many models feature an adjustable precision angle to cater to different knife types. While smaller angels can work for most standard kitchen knives, to sharpen a hunting knife, you will need something with a great erangle. For instance, most paringknives can work with 17 degrees or less and standard kitchen knives will sharpen well between 18- 25 degrees. However,for a hunting knife you will need something between 26 and 30 degrees. This will give you the right balance of sharpness and strength for such devices. 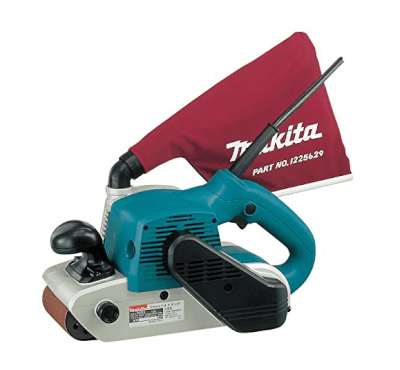 Electric knife sharpeners are time saving tools that come equipped with powerful abrasive wheels. They can get the job done in a fraction of the time as well as save you the elbow grease needed when using a manual sharpener. There are single as well as multiple blade slot machines to offer more versatility. Your choice will depend on your needs. If you only have one or two similar hunting knives, then you may well do with a single slot machine. For others, the multiple slot machine will cater to many different types of knives. Some electric sharpeners can handle much more than kitchen and hunting knives including ceramic knives, scissors, cleavers and other tools. Also, look for something that comes with a warranty. Typically, the best electric knife sharpeners will offer a two to three year warranty, giving you enough time to ensure that any defect with the product can be fixed for free. Place knife in the sharpening slot and hold down firmly. Avoid applying too much pressure or it may damage the knife. Starting from the heel of the blade, run the knife through the slot, pulling slowly up to the tip. Repeat this step twice on either side of the blade. Test the sharpness of the blade and if needed, repeat again. When done, rinse blade under cool water and dry with a towel. A lot of sharpeners cannot handle serrated knives, so make sure that you get something with the ability to sharpen serrated knives if your have these in your repertoire. Knife materials such as ceramic, titanium and tungsten carbide are special and need sharpeners up to the task. For home use, go for a low noise model as commercial models are large, noisy and bulky and meant to be used over and over again. A quality electric sharpener for hunting knives will take the guesswork out of the sharpening.These are useful, fairly simple to operate devices and a verysuitable addition to your DIY arsenal.